Ansei-era five years, and about 150 years ago, the "Matsu" of a building is begun and a traditional building remains.If an Entrance is entered, an iron teakettle is applied to a free key and much old folkcraft is placed.The inside of a hall which makes a sound creakily shone black with few lights of the lamp, and has left the atmosphere of the traditional medical-treatment spa resort as it is.The restaurant with a sunken hearth is a building of a brilliant beam and post with an impressive wooden floor which is reconstruction of a wealthy farmer private house.Although it was imagining very that a Rates was probably also high from the fulfilment of institutions, it was an inn of the delightful rates for a mountaineer or visitors to a hot-spring resort. 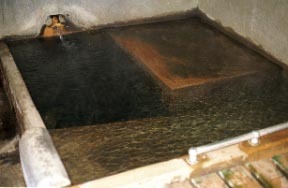 "Hot spring of Share" Separated by gender. Cascading water hot springs, mixed bathing which fall from the fountainhead of a hill at the back as [ the very ]. 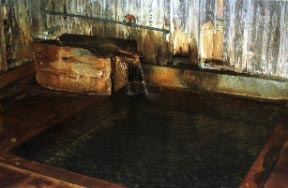 The below hot enough spring with a sleeping tub is the highest when the card under paradise and bathing can just be covered, but please give it to me just for a moment. ... account of later: -- the place for which I asked you -- from the first -- an inner key -- enough that's right.It is said that it can use like a charter bath by first come, first served. The visitor of hot-spring cure stay is also also the common dish and country-style-dishes wind which was rich in Variety by which weariness does not come. 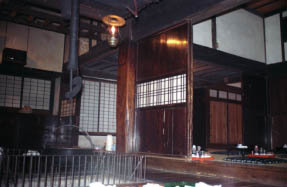 Between the wooden floor of a sunken hearth end, or tatamis. 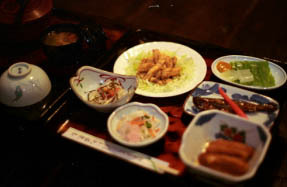 A meat deep-fried-dishes ethnic wind, cuts of pork boiled with sugar, soy sauce, sweet sake and salt, a landlocked salmon dish grilled with salt or candied food (based on a Rates), konnyaku sliced raw fish, a vinegared, a salad, and ken Ting soup are the another helping freedom from the cooked in a pot of a sunken hearth. Only for a woman "hot spring of eyes"
It is also called the hot spring which an included hot spring is made good for eyes in alum, and is blessed with Gasteria gracilis var. 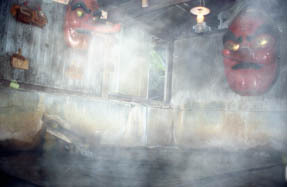 minima.Many votive pictures are covered over a tengu's hot spring. Since foods, a seasoning, a yukata washing implement, etc. 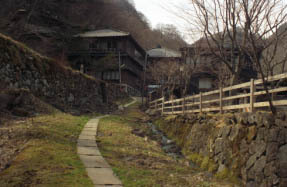 are not attached to a hot-spring cure plan, bring with you. The pots-and-pans tableware can use (also in case of chopsticks). You can use the refrigerator of the room and a kitchen. Cancellation charge serves as 100% of an On the day 50% on the previous day. A yukata loan is 350 yen to the visitor of a hot-spring cure. Heating of a Matsu and a Take becomes only a kotatsu.Since it is very cold during winter, please bring dressing gown with you.A Matsu becomes a ridge of a tengu's hot spring and is comparatively warm. Bus operation of winter (* 2015-2016): 1. Nasushiobara 8:30=> Nasu Yumoto > Oomaru.2. > Oomaru via Nasushiobara 13:30=> Kuroiso.It changes to an Oomaru at descent and is Kita-Yuguchi alighting.It is No. 2 per day above.Since Nasushiobara to about one Nasu Yumoto has in 1 hour, he becomes a taxi from Yumoto.It is more convenient to get off in front of a taxi company (0120-020-031) from Nasu Yumoto at an enough bus stop "Shin-Nasu", when using a taxi.